It’s been said that all that glitters is not gold. How true. Some of what glitters is also Pink, Silver, Black, Orange, Yellow, Green, Light Blue, Red, and Royal Blue. And now those colors can be applied in layers. We’re talking about heat transfer film of course. 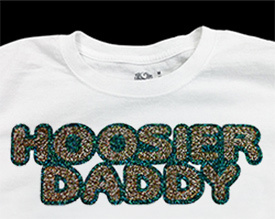 Specifically EnduraTex Bling, our hot-selling glitter flake cad- cuttable “T-shirt vinyl”. EnduraTex Bling is popular for cheer and spirit Tees, custom fashion wear and graphic tees. Since it’s so much thicker than most heat transfer films, the conventional wisdom has been that it’s not suitable for layered graphics. But we’re now informed by the manufacturer that our product can indeed be applied in layers. This opens up more creative possibilities for garment decorators. How does this work and how does it benefit your shirt shop? EnduraTex Bling is a 12 mil (300 micron) polyester/aluminum heat transfer film on a clear polyester self-adhesive release liner. We call it “Bling” because its high metal flake content gives it a dazzling look not unlike rhinestones and sequins. It’s suitable for application on cotton, polyester, cotton-poly blends, acrylic and similar fabrics. Application on heat-sensitive materials such as nylon, silk and leather is not recommended. This is not a stretchy film so we don’t recommend it for use on Lycra spandex or other performance apparels. All other fabrics are considered non-standard applications. For these we suggest you do some application and wash testing before committing to production. Bling comes in 20″ by five, twenty-two, and one-yard rolls, starting at only $13.79 per roll. It’s currently available in ten colors, but seven more are coming to our warehouse as you read this so the product line will soon offer 17 dazzling ways for you to ‘bling out’ your custom apparel. And yes, these can be mixed and matched in overlapping and layered patterns just like HotMark, Resolve Plus, Style and most other EnduraTex heat transfer films. And like those films, there is a recommended process for successful layering. Applying EnduraTex Bling heat transfer film in layers begins with knowing how to plot, weed and apply it in single layers consistently. Load the film so that the glossy side is face down. The matte or semi-gloss side should be face up. If your roll arrives glossy side up, you’ll need to re-roll it or load it facing rearward in your plotter’s media rollers and reverse-feed it through the plotter with plenty of slack. You’ll need to use a 60° blade. But before you start carving up your film and playing with the pressure settings, test the blade depth by manually drawing the blade holder across the surface of the film to ensure you have enough of the blade’s cutting edge exposed to cut through the film. Draw a box on the film, then see if you can weed it. If so, insert the blade holder into your plotter’s tool carriage and adjust the force. Start with about 200 grams of force or a setting of 20 on your Graphtec or Vinyl EXPRESS Q Series plotter. Then perform a test cut and weed that to make sure you’re cutting through the film, but not cutting too deeply into the liner. The next challenge is weeding. Due to the high metallic content, Bling can be sometimes hard to weed simply because the light playing off the metal flake in the film breaks up the cut lines. If you’re having trouble finding them, sprinkle a little baby powder on the film. It will sift into the cut lines and illuminate your path. Weed carefully. Any film with high metallic content loses some plasticity, so it’s possible to tear it if you weed Bling as aggressively as you would HotMark. Applying Bling in multiple layers is much the same as applying it in a single layer. The standard heat press directions for the film suggest a press temperature of 320° F (160°C), medium pressure, and 15 – 20 seconds. Allow it to cool to room temperature before gently peeling the liner. If you’re applying layers, keep in mind that the bottom layer will be pressed twice, so you can apply that one for 12 seconds or so; just long enough to allow you to remove the liner. So for the base layer, press it for 12 seconds, cool, then peel. Then apply the second layer or overlapping graphic and press that one for 15 to 20 seconds (If this is the second of three or more, use the 12 second time setting here too). On the final layer or color, use the full 20 seconds with medium pressure. Then after you’ve peeled the liner, cover the entire masterpiece with a Teflon sheet or silicone paper and give it a quick five second re-press to seal the deal. We should note that, according to the manufacturer, not every glitter-flake T-shirt film can be layered. So it’s best not to assume that you can do this with other products on the market. Adding the option of a second layer or overlapping designs opens up the creative envelope for garment decorators. Most professionally decorated garments require a second color and many commercial orders from small businesses, teams, and clubs include logos and other two-color design elements. The overlapping option means you can sell more of this highly desirable glitter-flake film for these kinds of orders. Success in retail often depends simply on giving customers what they want. If they want their two-color logos blinged out, now you can say “Yes ma’am, we can do that!” Just make sure you’re using EnduraTex Bling and you’re applying the layers properly.